“It is said to be a very rustic meeting- place for a very frivolous society, and that if one goes there alone, one returns in the company of at least one other person.” Berthe Morisot’s mother 1868. Monet to Frédéric Bazille: "I do have a dream, a painting, the baths of 'La Grenouillère' for which I've done a few bad rough sketches, but it is a dream. 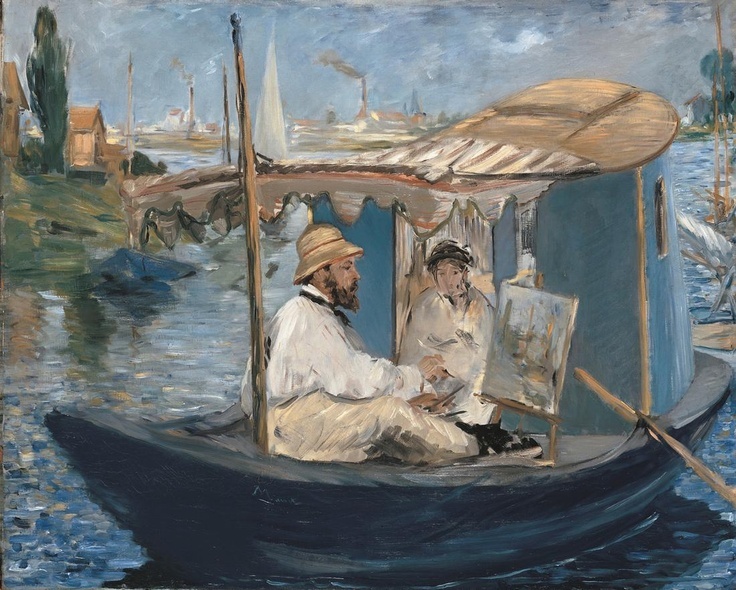 Renoir, who has just spent two months here, also wants to do this painting." September 25, 1869. “In the final analysis, it is not true nature that they have looked at and strive to render, but rather the nature one glimpses on escapades in the great city or its surroundings, where the harsh notes of the houses, with their white, red or yellow walls and their green shutters, get mixed up with the vegetation of the trees and form violent contrasts with it. How much better have the Dutch painters and our modern landscapists, the Rousseaus, the Corots and the Daubignys, understood how to express not only the true poetry but also the truth of nature!...” Charles Bigot, art critic on the 1877 show.